Legal news for product liability attorneys – Glutino Food Group and the FDA announced a recall of Glutino Raisin Bread due to undocumented egg ingredients. One batch of Glutino Raisin Bread contained egg, due to packaging mix-up. Lawrence, MA – The Glutino Food Group, located in Lawrence, MA, voluntarily recalled the product Glutino Raisin Bread on April 1, 2010, due to the fact that it may contain egg product as an ingredient, which was undeclared on the label, as reported by the U.S. Food and Drug Administration, (FDA), www.fda.gov. Consumers who have sensitivities or allergies to eggs hold the risk of serious or life threatening allergic reactions if the product is consumed. 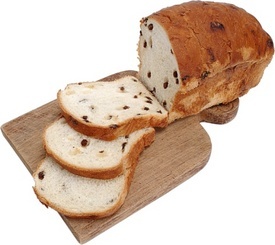 Glutino Raisin Bread is distributed nationwide in retail stores in the frozen food section. The company initiated the recall after it was discovered that the product’s UPC was not scanning correctly within retail stores. The bread was placed in packaging intended for a different product. An investigation into the matter found the mix-up to be resultant of a temporary issue in the company’s packaging system. Those who have purchased Glutino raisin Break are advised to return the product to the place of purchase for a full refund. Any questions should be directed to Glutino at 1-800-939-8417, Monday through Friday, between 8:30 a.m. and 5:30 p.m. ET.